WildCare - WildCare - Take Action - Is Your Shopping List Killing Songbirds? WildCare - Take Action - Is Your Shopping List Killing Songbirds? Is Your Shopping List Killing Songbirds? 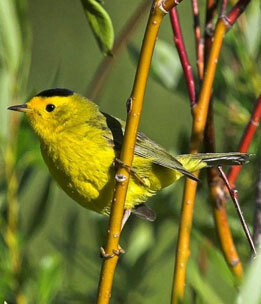 Wilson’s Warbler is a neotropical migrant that lives in the Bay Area in the summer and spends the winter in Central America. These and other insect-eaters can be affected by pesticide use in both countries. Once grown these babies will face hazards from cats, windows and pesticides. They are fed every 45 minutes in WildCare's Birdroom. Bananas have one of the highest pesticide loads of any tropical fruit. Be sure to buy organic bananas, tomatoes and strawberries, and purchase shade-grown organic coffee. 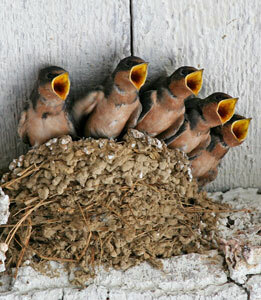 Barn Swallows winter in Central and South America, but raise their babies here. Many Swainson's Hawks migrate an astounding distance, only to die of pesticide poisoning in Argentina. Bee houses are easy to make and encourage native pollinators. 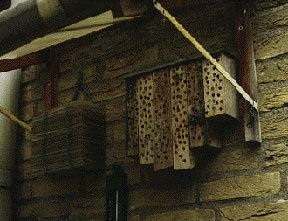 Click to WildCare's April eNewsletter for easy bee house building instructions. Pesticide use is of special concern, due to the large amounts of produce being shipped to North America from Latin American countries that use pesticides. Click for A Shopper's Guide to Pesticides. “Since the 1980s, pesticide use has increased fivefold in Latin America as countries have expanded their production of nontraditional crops to fuel the demand for fresh produce during winter in North America and Europe. Rice farmers in the region use monocrotophos, methamidophos and carbofuran, all agricultural chemicals that are rated Class I toxins by the World Health Organization, are highly toxic to birds, and are either restricted or banned in the United States. In countries like Guatemala, Honduras and Ecuador, researchers have found that farmers spray their crops heavily and repeatedly with a chemical cocktail of dangerous pesticides." Of course it's important to note that these chemicals, while banned in the United States, are nevertheless often purchased from U.S. chemical companies. Many species of North American songbirds migrate to follow food sources as seasons change and insects dwindle. Barn Swallows winter from central Mexico as far south as Argentina. Blackheaded Grosbeaks and Wilson’s Warblers travel to Panama. Swainson’s Thrushes winter in Colombia, Peregrine Falcons in Argentina. 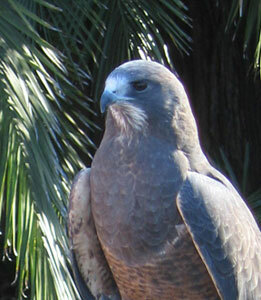 In the mid-1990s, American biologists used satellite tracking to follow Swainson’s Hawks to their wintering grounds in Argentina, where thousands of them were found dead from monocrotophos poisoning. Buy locally grown produce. In countries like Guatemala, Honduras and Ecuador, pesticides (often purchased from U.S. companies) that are rated Class I toxins by the World Health Organization and restricted or banned in the United States are frequently used. Buying local produce means you avoid exposure to these pesticides and diminish the market for produce grown using these chemicals. Coffee. Most mass-produced coffee is heavily treated with fertilizers, herbicides, fungicides and insecticides. Bananas are typically grown with one of the highest pesticide loads of any tropical crop. Tomatoes, bell peppers and strawberries are some of the most frequently purchased out-of-season items. Enjoy these and other fruits and veggies in-season, or insist on organic choices. Dispose of your pesticides and synthetic chemicals appropriately to safely keep them out of the environment. If you live in Marin County, safe disposal of hazardous waste is handled by the Marin Recycling Center. Click for information on the Household Hazardous Waste Facility in San Rafael. Not in Marin? Google your local hazardous waste facility. purchase agricultural products that support the conservation of birds and their habitats. Urge your U.S. Representative to reauthorize the Neotropical Migratory Bird Conservation Act (H.R. 5756). To date, the Act has supported vital conservation projects in 44 U.S. states and territories and 33 Latin American and Caribbean countries. WildCare is part of the Act for Songbirds Coalition through the Bird Conservation Alliance. Poisons used on crops to control pest insect species affect bees, too. Like many other creatures in the natural world, bees are being poisoned by pesticides and pushed out of their natural habitat by human development. In the face of declining populations of bees, what can we do to encourage the pollinators we depend upon? The Honey Bee is only one of about 25,000 bee species known worldwide. California alone has more than 1,500 species of native bees. 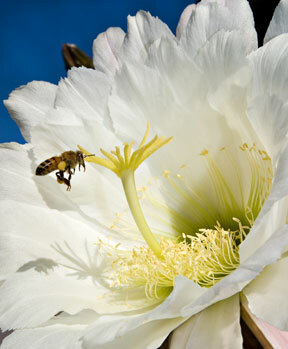 They were here pollinating native plants long before the Europeans introduced the Honey Bee. Native bees lack the familiar social lifestyle of honeybees and bumblebees, and are largely solitary in their lifestyle. They do not live in hives and do not produce honey but they have equally important roles in gardens and natural ecosystems. Cavity-nesting bee species use old trees or human structures of wood or metal, or even mason blocks for making nest cells. If we can provide safe habitat for these natives we can encourage them to thrive. Don’t use pesticides and synthetic chemicals. Do your weeding and watering by hand. Avoid the use of mulch or plastic. Leave dead trees alone whenever possible. Dead trees, known as snags, are some of the most valuable real estate available for many species of wildlife. If you can safely leave them to decay, you create habitate for multitudes of species of animal. Buy or build a bee box. Bee boxes are easy to make, and having solitary bees around will help your garden grow. For more information about encouraging bees in your garden click to visit this article on Native Bees in our April 2008 WildCare eNewsletter.